In the last blog post from our Corporate Commuter Shuttle company in San Francisco, we looked at the history of why Americans are far more dependent on their personal automobiles than most people in other countries. We also briefly touched on the problem and cost of making individual cars our primary transportation method across the country. However, even though it’s costly for each person to drive everywhere they go, it’s also difficult to implement a viable solution because of certain barriers that stand in the way. 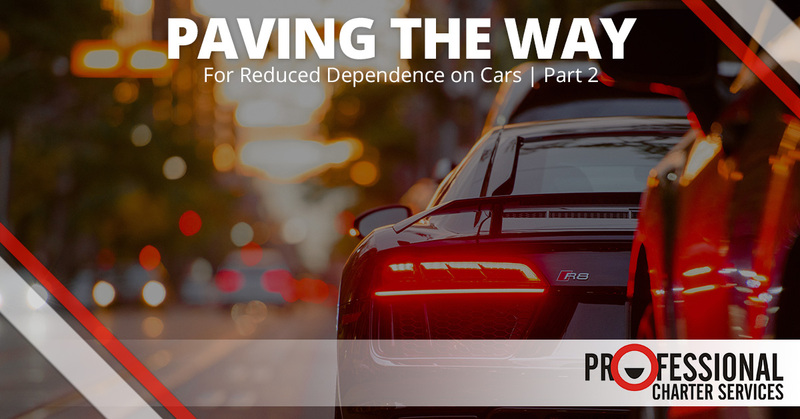 Today, we’ll look at those things and discover why it’s not that simple to simply realize that our dependence on driving is beginning to be a problem. In Europe, it’s common to be able to walk to the grocery store and run other common errands. In America, it’s unheard of (or it’s a fluke if you happen to live close enough to walk). America has had the luxury of land availability, making us a spread-out, sprawling culture where everyone has plenty of space. This is reflected in the design of our cities, our living quarters, and even the width of our parking places, which tend to be approximately 1.5 feet wider in the US than in Europe. People have long been used to having a house and yard in the suburbs rather than living in an apartment in an urban area. However, there simply isn’t room for everyone to have a half-acre lot and also find themselves within walking distance of the grocery store. Reducing our dependence on cars requires us to think through viable solutions that allow people to get to the places where they need to go. It’s part of our independent nature that we want to do our own thing, precisely when we want to do it, without interference from other people or circumstances. We don’t walk down the street in proximity to other people with whom we can wave and exchange a friendly greeting. Instead, we drive down the street, surrounded by the metal-and-glass bubble on four wheels that protects us from ever having to interact with strangers. When your car is a sanctuary, it’s hard to reduce the amount you use it. Greener solutions for our cities will have to take this factor into account. In Europe, it’s as natural as can be to ride a bus, purchase a train ticket, or ride the subway. In America, however, our unfamiliarity with other styles of public transportation leads us to be uncomfortable with the idea. People tend to avoid what they do not understand, and if public transportation is one of the things that people don’t feel comfortable with, it’ll be hard to bring them to use it. This is one of the areas where we feel that San Francisco is pioneering the way for other American cities to follow. While many larger cities have some sort of public transportation system available (i.e. city buses), in San Francisco, it is far more mainstream. While in many cities, you’ll typically find the lower-income portion of the population on public transportation, in San Francisco, you can find people of all walks of life riding our buses and trains. Following from the fact that public transportation primarily services the lower-income population in many cities in the US, some wealthier people consider there to be a stigma attached to riding on a city bus or train system. This is an unfortunate extra hurdle that public transportation must solve in order to truly develop into a broadly-accepted thing in our society. When you think about it, there’s nothing intrinsically wrong, shameful, or unsavory about riding on a bus, train, or subway. The only thing that makes it feel like it is prejudice. We need a public transportation system that people don’t look down their noses at, feel unsafe using, or avoid because of prejudice or stigma. Stay tuned for our next blog post, when we’ll cover some of the ideas that our Corporate Commuter Shuttle company has for solutions that will take the public transportation system to the next level. Everywhere in America, people need options that will allow them to reduce their dependence on cars, and we are committed to doing our part to bringing that to pass. Contact us for a quote today.